Young's pub in the City. Was in the 2007 Good Beer Guide but not the 2008 one. Note that it has very limited opening hours on weekends. Food is served noon-9pm Monday and Tuesday, noon-10pm Wednesday to Friday, and noon-4pm Saturday and Sunday. It's fairly expensive, but more interesting than standard pub food; sandwiches (e.g. chargrilled vegetables and hummous; peppered pastrami with mustard and gherkin) are £5, while mains (e.g. goat cheese, spinach, and red onion tart; steak and mushroom pie; mussels) are around £10 and puddings (e.g. sticky toffee pudding) are £5-5.25. They also offer platters to share, for £13-14 for two people or £23-25 for four. Photo of the full menu as of October 2007. 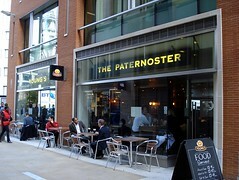 Note that this pub can be a little hard to find; the "Paternoster Square" part of the address is rather misleading. Queen's Head Passage is a small alley leading south from Newgate Street, and the pub is on the corner of Queen's Head Passage and Newgate Street. The gmap link above should be accurate. Last visited by Bob, July 2017. Food times and prices taken from blackboard and menu outside on a 2007 visit. Opening times taken from the 2007 Good Beer Guide. Last edited 2017-07-27 19:21:54 (version 21; diff). List all versions. Page last edited 2017-07-27 19:21:54 (version 21).